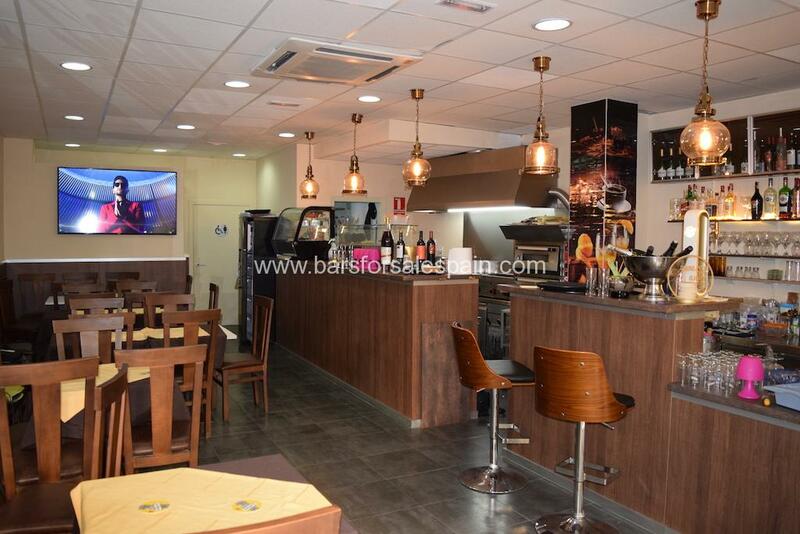 This modern recently reformed Restaurant Bar has become available one of the most desirable locations in Fuengirola. The pedestrianised street has an incredible vibe with street music and numerous bars and restaurants for all tastes. A suitable a couple or partnership could take over the business immediately and trade out of the box. As you enter through the glass stacking doors the interior is 80m2 with seating for up to seven tables. The modern bar is fully stocked with an impressive wooden theme throughout. The interior has a great ambience and has a warm but high class feel to it. A large mirror on the left-hand side gives an impression of space along with the expensive bar stools that match the bar theme. The open kitchen which is situated behind the bar is fully equipped and at present offers a varied menu offering kebabs and other Persian delights. However, you could offer a bigger selection to your clients. The ceiling has been soundproofed to cope with the large stainless steel extractor to keep the bar free from the cooking food. A brand new double fridge completes the bar area. Further back you have ample storage with more refrigeration and preparation areas. The biggest feature of this café bar is the location. Situated on one of the most prestigious streets in Fuengirola. The footfall here is incredible. Clients move from bar to bar and then enjoy a variety of restaurants on the pedestrianised street. The terrace is 20m2 and can accommodate up to 18 people. The front has a modern inviting look and will attract customers walking through the Los Boliches area from morning till late evening. Fuengirola is situated between Malaga and Marbella, close to the town’s of Mijas and Benalmadena; it is one of the most popular tourist towns on the Costa del Sol. A great holiday choice for families and children with a fantastic offering of beach, facilities, and activities. Bars for sale Spain is one of the longest established British commercial brokers based along the Costa del Sol. specialising in the sale and transfer of Bars, Cafe Bars, restaurants and pubs. We are a friendly family run company with over 50 years of experience. We have a wealth of local knowledge and expertise. Our after sales service is second to none. We are a fully registered SL company with our head office in Fuengirola and satellite offices in La Cala Golf and Alhaurin de La Torre and have the most comprehensive selection of businesses covering the areas from Nerja to Duquesa.